There were times when I was hiking miles and miles of Blue Ridge Mountain trails when, after carefully watching my step along rocky outcrops, with tree roots waiting to grab my foot to put me down, when I’d look up and say to myself, “Wow, that’s a surprise!” Today, I no long hike those trails as age and health issues have made me mostly use my car more than my feet to get me places, but I still find surprises along my way. The above photo is one such find. 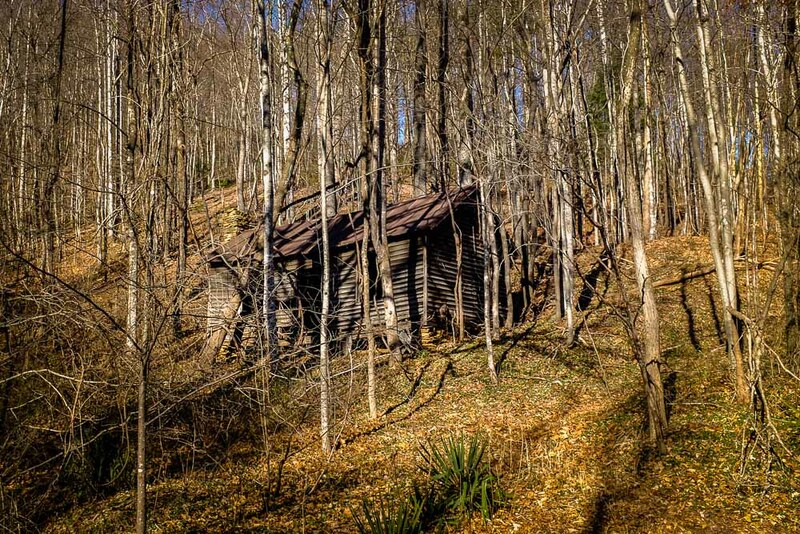 Had leaves been on the trees, I’d probably not have seen this old cabin in the woods as I drove slowly past, on a very steep and winding downhill narrow road in the Blue Ridge Mountains. But I did see it. Problem was, I was moving about 15 MPH on a road where stopping was not a very safe option, given the possibility of following traffic. However, I tend to drive “out the back window” as I learned while driving the fast Autobahns in Germany, always shifting my view from front to back in the mirror to see if any cars were closing in. Thus, I was confident there was nothing behind me, so I stopped, backed up, opened the driver’s side window and made this photo. As soon as I did, I noted another car winding a curve behind me headed my way. I had ample time to start moving along safely and smiled at what I’d done. Sometimes, I guess you have to take a risk to find a surprise. If you never look, you’ll never find. I call this a drive by shooting.